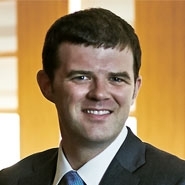 Patrick Johnson is an associate in Herrick’s Litigation Department, where he focuses on a wide range of issues arising in litigation, including real estate and broker-dealer disputes, and employment litigation and counseling. Recently, Patrick was a member of the Herrick team that defeated an employer’s preliminary injunction request, filed against a consumer products entrepreneur in federal misappropriation of trade secrets litigation. Patrick was also a member of the team which successfully settled a high-profile international dispute over the ownership of Pablo Picasso’s Bust of a Woman sculpture, allowing Herrick’s client to take possession of the piece. Patrick has also litigated a variety of real estate and commercial disputes in New York state court. Recently, he helped to secure a preliminary injunction against a property management firm and two of its principals, alleged to have misappropriated income from three valuable Manhattan apartment buildings. While in law school, Patrick served as the speakers and events chair for the Harvard Food Law Society. He also interned at the City of Boston Legal Department. Before entering law school, Patrick worked as a sentencing advocate at Court Consultation Services.